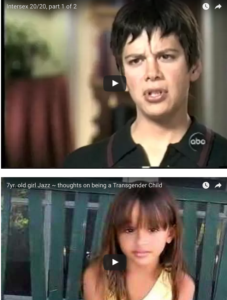 Psyched to find this old post of video interviews of Jazz, a wise 7 yo trans girl, and I. I love that she says, “It doesn’t matter if you’re different from anybody else, it just matters if you’re having a good time & you like who you are.” So true! And notice they say I could be a “boi” if I was Korean– not the 1st time someone made this point. I don’t always look like a boy, but when I do I’m Asian, lol! ← My Intersex & Non-Binary Pride Video!